GDC: Chris Bell – Designing for Friendship & Meaningful Relationships | Motivate. Play. Meaningful relationships and anonymity. These are things that we don’t often consider together. In fact, much of the evolutionary literature on relationships and trust suggest that anonymity can deteriorate relationships. Yet, this strange conceptual pairing is exactly what game designer Chris Bell is thinking about and implementing in his own games The Way and Journey. While at GDC I was lucky enough to attend Chirs’ talk titled: Designing for Friendship: Shaping Player Relationships with Rules and Freedom and speak briefly with him afterward. In the talk Chris describes how designers can think about the relationships in their games. For me, and I imagine many others in the room, it was a breath of fresh air. Chris’ ability to describe meaningful yet fleeting relationships in his life and in his games provided me with a new perspective for thinking about communication. And it is communication – thinking about the interactions between individuals –that is at the core of Chris’s talk. I’ve done my best to present his ideas below. I’ve also expanded on them where I could and marked my expansion (Travis). That said, I want to make certain that I give Chris credit for his ideas. I am sure he has probably thought about much of this before, but some of it was not readily available in the presentation or the short conversation I had with him. Chris, if you are out there and you read this, feel free to provide any form of clarification. Shared Goal: Having a shared goal can provide players with an easy means for receiving a positive outcome from the game. In his experience with the Japanese woman the shared goal was to reach the landmark a quickly as possible. For example, in Journey the goal for the players is to reach the mountain. (Travis) Is a shared goal necessary for a meaningful relationship? Well, a positive interaction can occur when players have separate goals, yet engage in a way that has a non-zero sum outcome. I think having a goal that is perfectly shared isn’t necessary, but goals that keep the players working together for an extended period of time and allow them to engage in gains from trade are necessary. One way to ensure that you have a non-zero sum outcome where gains from trade are possible is to create a shared goal where two players have a better chance of succeeding than one. Freedom of Choice: Self-determination or at least the perception of self-determination is an important part of gaming. To feel a connection with another player an individual must have the opportunity to choose to cooperate. In the case of the Japanese woman she made a conscious choice to abandon her conversation and help Chris. Self-determination provides a strong connection because individuals recognize that the other player is making a conscious choice to engage with them. Anonymity: Anonymity creates a spontaneous and mysterious connection. In a more pragmatic sense it also prevents individuals from gaming the system when communication is the puzzle. Without anonymity players can exchange information that allows them to communicate outside of the game. In Chris' example he and the Japanese woman were anonymous because of the language barrier and the location. (Travis) I've often talked about anonymity in a negative light here on Motivate Play, but Chris makes a wonderful point. First, there is a certain degree of mystery to an anonymous connection, instead of passing an immediate judgment based on the characteristics of the person – something we as human beings do subconsciously every time we meet someone. We instead connect to the avatar of the player and can have a relationship without all of the biases that often cloud our impressions of an individual. Vulnerability: Vulnerability makes it so that we must rely on the other person. There is a certain degree of trust that is necessary for a relationship. Trust comes when we have something to lose. In Chris' example he was vulnerable because he did not know where he was and he would miss the bus if he was late. He relied on the direction of the woman and had to trust in her judgment. Communication: Finally, there must be a careful consideration of the methods of communication. We must ask how do the other game mechanics interact with communication? Think about cooperative puzzle solving under any circumstances: Communication is important. If a solution is not readily identified collaborators must begin to create a shared definition of the puzzle. Once they understand the problem that is trying to be solved, they must then communicate in an effective way to solve it. In many puzzles the answer isn't always clear, and there exist a variety of suitable solutions. In this case, solving the problem requires coming to an agreement that a solution that is acceptable for both parties. In cooperative puzzle solving communication is key. To illustrate this point Chris has us consider the following problem: Portal 2 is a cooperative puzzle solving game. However, when players play the game the solution to the problem often becomes apparent to one player before it becomes apparent to the other. Once apparent, the knowing player need only communicate the solution to the other player. In Portal 2 the communication system works very well. Players who know the solution are easily able to communicate to the other player where to put their portals. When two players are mismatched in puzzle solving skill or one player has played the game before, Portal 2 quickly becomes a single player puzzle solving experience. One player solves puzzles and the other takes orders regarding where to put their portals. To make this more clear, Chris cited an example from his game Journey. 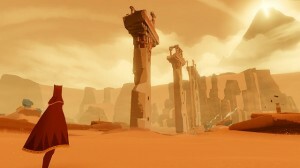 In Journey a player is moving toward a mountain. At first they do so alone. However, as the game progresses they begin to pair up with other players. Each player can communicate in the form of a call/song that they can change and customize. By calling out, one player charges the other player’s special ability, which allows them to fly for a short amount of time. Players who can communicate with one another effectively and synchronize their calls/songs can begin to engage in a patter on hoping as they call, fly, call, fly. In the case of Journey the development team has designed communication to interact with other game mechanics. In both Journey and The Way Figuring out how to communicate becomes an essential puzzle of the game. (Travis) The solution space for the puzzle is also important. Goals that have a concrete solution such as those in Portal or Braid require a lower bandwidth of communication. In those games you know you have the tools to solve the problem. In addition, defining the problem is also less difficult as players have a clear goal. An interface that allows rich communication which is directly tied to the game mechanics can quickly make the Portal 2 experience described above. Rich communication maybe required in situations where there is not a clear goal or puzzles that have a range of solutions, take the RTS Warhammer 40k: Dawn of War 2. In DoW2 game, players have wide range of solutions to a given problem and defining the goal and solution can be challenging even with very rich communication. It is important to think about the clarity of the goal and the solution space as you build communication tools into the game. Overall I thought Chris’ talk was one of the best of GDC. He drew from many rich examples and challenged conventional thinking as he described his take on how create meaningful relationships in games. I hope I did a reasonable job of representing his ideas and I encourage you to try Journey when it releases on March 13, 2012. GDC: Chris Bell - Designing for Friendship & Meaningful Relationships by Travis Ross, unless otherwise expressly stated, is licensed under a Creative Commons Attribution-ShareAlike 3.0 Unported License. I'm a marketer and have recently completed an interdisciplianry review of MMOGs. I've also been preparing a review of avatars and identity. So I look at trust and anonymity from a relationship perspective. While Hemp (2006) suggests “avatars’ anonymity is part of their appeal”, I also found this paper which suggests that if anonymity is part of the accepted ‘game’ process which the participants are aware of then anonymity is not an issue (Marx 1999 p.108). As for building trust in MMORPG's allowing others to use your avatar is one part of this process reported for Asian users - sorry can't remeber ref. off the top of my head - let me know if you need it. Also there's work showing that trust in communities is greatest at the guild level. Hi Janet, thanks for the information. I'm glad that you are compiling some of that work because the older stuff often gets overlooked. If someone was interested in seeing your interdisciplinary review were would they find it?